almond extract. Next, fold in the 2 cup of fresh SLICED strawberry. Pour batter into prepared pan and bake 50 minutes or until toothpick inserted comes out clean. Let cake rest on counter in pan 20 minutes. Then, invert cake onto serving plate to finish cooling. While cake is cooling. To make the frosting, beat melted butter with powdered sugar, almond extract and milk until its a little creamy. I like it a runny …so I added more milk. 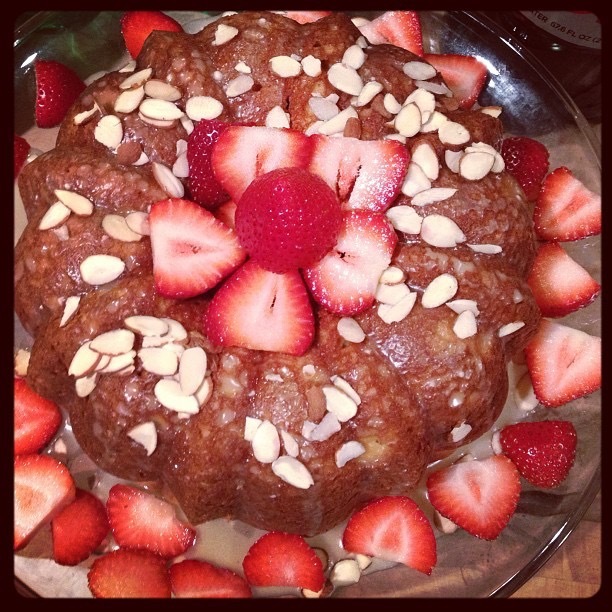 Pour over the cooled cake and top with slivered almonds and FRESH SLICED STRAWBERRY.